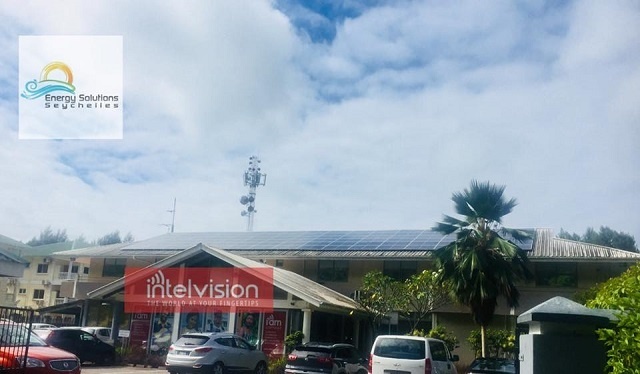 (Seychelles News Agency) - Intelvision is set to be amongst companies with the largest PV systems on the island nation after the installation of a 100kw system at its headquarters and plans for more installations at other offices. An engineer at the company, Krassimir Bebov, told SNA last Tuesday that the management has been thinking for a while about going green and installing solar panels at its headquarters at Providence on the eastern coast of the main island of Mahe. “Finally we made our decision because we could only see the positive benefits of generating electricity from the sun. So we decided to invest in the 100kw system which was installed as this is what was allowed by the Public Utilities Corporation. We hope that this move will help us save our electricity costs by half,” said Bebov. Intelvision Ltd is an entirely Seychellois-owned company providing TV, internet and voice services to the local market. The work to install the solar panels was undertaken by Energy Solutions Seychelles (ESS) and was done over two weeks. “We are very happy with the contractor and we are only waiting for the utilities' company to commission the system. We hope that this is done this month and from then on we will know the real benefits,” explained Bebov. EES said through its page on social media that the system has a surface area of an Olympic size swimming pool worth of solar PV panels. "The environmental impact is a large carbon dioxide offset of 332 Metric tons pa.” EES said that this equivalent to removing 69 cars off the road per year, with the bonus of substantial financial savings. Intelvision is set to become one of the largest companies using solar energy as it has plans to install a smaller system at its other offices. “We have submitted an application for a smaller system of about 14kw for Capital City building in town and we are still waiting for permission,” explained Bebov. The Central Bank of Seychelles based in the capital city of Victoria has to date the largest system in Seychelles - a group of 115 islands in the western Indian Ocean. The bank has a PV system of 140kw. 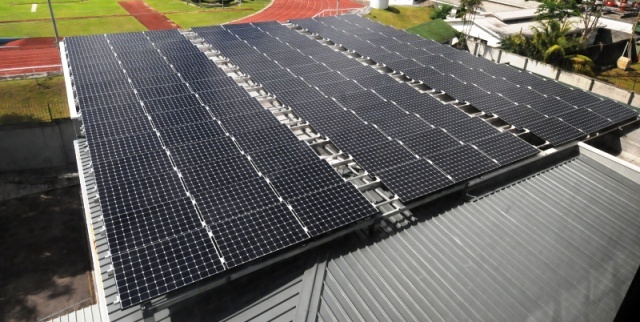 In recent years there has been a lot of efforts by the government to encourage companies, businesses and individuals to go green and use the sun - in abundance on the islands - to generate electricity. In 2014, the government launched a new scheme, SEEREP - Seychelles Energy Efficiency and Renewable Energy Programme. The main objective of SEEREP is to encourage the adoption of energy-efficient home appliances, efficient lights, energy saving devices such as solar water heaters and Renewable Energy Technologies (RET's)in the domestic residential sector, made accessible to the public through an affordable finance from the commercial banks. According to the ministry of Finance, Trade and Economic Planning, under the revised SEEREP, small businesses can benefit from a loan amounting to RS 150,000 at 5% interest rate with the commercial banks or Development Bank of Seychelles to invest in energy efficient and environmentally friendly appliances. Since its introduction, 67 loans have been approved totalling $200,000. Bebov said that Intelvision has more plans to reduce its carbon footprint further. “With a large fleet of cars, we are thinking of switching to electric cars,” said the engineer, who adds that rainwater harvesting is also on their plans to operate in a more sustainable manner.